My Girlish Whims Turns 3 - GIVEAWAY! Three years ago today I posted my FIRST tutorial to the internet ever. Wow, what a long way I have come! I have certainly learned a lot about blogging over the past few years. Using a good camera, posting BIG photos, focusing on my niche, etc. I have also enjoyed being a part of the "blogging community" for the past few years as well. I've followed some bloggers for the full three years and watched them blog about getting pregnant and having a baby and they are like full grown by now! Or...ya know...two. Same difference. I've have some pretty big changes in the past three years as well. When I posted on January 7th 2011 I was home on winter break before going back to school to finish out my junior year in college. A couple months later I would be get engaged and then married and then here I am a wife almost married for two years!!! As a fun little way to kick off the year and celebrate my past three years of blogging, I've put together a little giveaway of some beading goodies! In the mix are some charms, pendants, crystals, and a bunch of green beads because I never wear or make anything in green haha. Just one of those colors that is not for me! So another green lover can enjoy them. The giveaway is open to US only. Enter in the widget below! THANK YOU for following My Girlish Whims. Here's to a new year of blogging and a new year of being inspired! Congratulations on your anniversary! Thank you for the chance to win! I've followed you for about two years now and I love it when your posts pop up in my reader. I always look forward to what you have to share. Thank you so much for all your hard work! well done on all you have achieved over the past 3 years!! Congrats and thank you for having the giveaway! I love your jewelry making tutorials! My cell service is being wonky at the moment so I apologize if this is a duplicate. Basically, I love your blog and your tutorials are fantastic. So excited to see what the coming year bring to My Girlish Whims! Followed for awhile now. Congrats on the anniversary! i have only been following you for a little while but really enjoy your ideas!! I think I've been following your blog for about a year now?? Fun fact--I think we have the same wedding anniversary! Same date AND same year. I love the fun and colorful jewelry pieces you put together--you would think that in such a crafty blogosphere there'd be more jewelry blogs, but I feel like they're few and far between. Thanks for coming up with so many great ideas! I found your blog by following the earrings you made for your bridesmaids and I've been hooked ever since. You have made me laugh - I mean the "roll on the floor til tears start flowing" laugh. I almost feel like I've "grown up" with you. Thank you and Happy Anniversary! Congrats on your blogiversary. I have followed you for about a year and love your Jewelery tutorials. I have learned a lot from your blog. Good job!!! I love your blog...I love entering the giveaways, and really enjoy reading your crafty posts....I've gotten some great ideas for jewelry making. Thank you so much for this awesome giveaway! My daughter and I love using beads for making earrings and bracelets, and I often use them in my crocheting. And...green is my favorite color, so I'm especially hopeful to win this great giveaway. :) And again...congrats!! Congratulations on your 3rd anniversary. I love to follow your blog because of the variety you offer. You always seem to have an upbeat feel. Thanks so much for all you offer. Congrats on your blogiversary. I think I've been following a little over a year. I could not tell you how I found you, but you weren't married yet when I started reading! I bet we'd have tons of fun if you were my neighbor. we could check out each others stashes and do some trades and make stuff together! Way to make it 3 years! Congrats. I found you through your link up - what a great collection of posts each week! Congratulations, Rebecca! Wish you many more years of success. We would so be bffs if we lived next door to each other. We'd be raiding each others craft rooms daily, lol. I absolutely love what a confident young woman you are! Keep at it! You make great stuff. I'm a new Bloglovin follower. Thanks for the great giveaway! i just found your blog, congrats on your blogaversery!!! I just found your site & I think it's awesome! I love making jewelry! I really like that you have the step by step tutorials & you show how to make designer pieces for just a fraction of the cost (gotta watch that budget!). Green is mine & my son's favorite color too. No such thing as too much green is there? If we lived next door to each other I bet we'd not only be bff's, but that we'd be up to no good more often than not! lol Congrats on your blogaversary, way to go girl! Time sure flies. Here's to many more blogging years ahead! Green is my favorite color!!! I just discovered you on Bloglovin. I've recently started following your blog and have enjoyed reading about your creations and inspirations. Thanks! I've been a follower for a good long time and LOVE seeing you blog posts in my email box. Even the name of your blog just draws me in! I love being one of your followers!! There's always something interesting to find out and learn about! I love your jewelry tutorials, I have been following around a year now. I love your blog. You have talent that I have tried to imitate. I cannot. 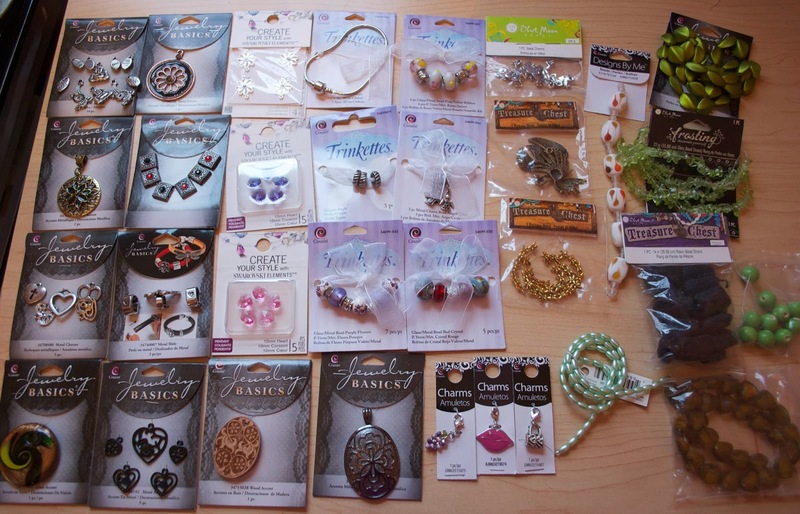 I give up on jewelry making, but one of my best friends is a beading whiz, and I'd love to win all these things for her. Congratulations on your "blogaversery" (is that a word?)! This is my first time seeing your blog - I'm here via a link-up at "Someday Crafts." I definitely think we would be best friends if you lived next door! I'm a brand new reader, and I really love your tutorials! Ive just recently found you but you seem pretty cool!